As part of his barnacle researches, Darwin examined different parts of barnacles under his microscope. 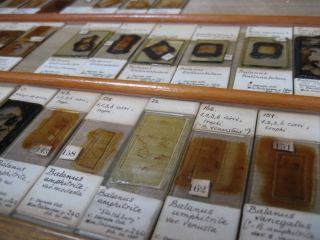 He prepared permanent slides which were labelled with a number which corresponded to a hand-written catalogue. On 20 February 1897 Darwin's son, Francis Darwin, presented the slides and the catalogue to the University Museum of Zoology in Cambridge. The following information about the catalogue is provided by the Museum and is kept with the catalogue. [in red ink:] The collection was received on Feb. 20, 1897. Mr. Darwin's numbers have been retained on the slides, which have been arranged systematically, in accordance with the order of the species in the two volumes of the cirripede monograph published by the Ray Society." The full sheet torn in half is then folded to give a convenient page size. The handwriting is contemporary with the Cirripede work. There seems no reason to doubt the record of the slides was made at the time of their preparation. pp1-18 probably earlier than the rest- in Lady Barlow's possession are children's drawings on the backs of cirripede notes on similar paper to this. "By Lyell's advice May 14th 1856." The cirripedes were "packed away, began working notes for species theory" Sept. 9th 1854. Click here to see a photograph of the Museum's accession catalogue entry. View Images of the catalogue. 1 Many of the existing slides have been remounted at some unknown date and new labels have been added to all by the Museum. Darwin's small printed label numbers have, however, been retained. The new labels give the volume and page number in Darwin's monograph where the specimen is described. REVISION HISTORY: Scanned by The University Museum of Zoology Cambridge University 7.2003. NOTE: Reproduced by permission of The University Museum of Zoology Cambridge and William Huxley Darwin.